One of our greatest understandings about the human body is that we can measure it's imbalances. For example, we have a good idea that your blood pressure is supposed to be around 120/80. When you go to the doctor, she takes that measurement and if it's not around those numbers she knows that this is an indication that something is not right. Same goes for blood tests that tell us cholesterol levels, hormone balances, or immune function. Anytime your doctor sees you out of the norm with these tests, there is cause for concern. Well the same goes for your spine. There are two ways to look at your spine. One is that it is an organ in your body that only needs to be addressed when it causes you pain. Or two that it is a crucial part of your body that is protecting your most important system, your nervous system. We strongly subscribe to the second way. If you stop and think about it, your brain is the most valuable organ you have. It is the master controller of every organ, tissue, and cell in your body. Your brain has only one way to get messages down to cells of your body. Through your nervous system. Your spine protects this communication system. It is like a big tube that surrounds life sustaining information going in and out of the brain. Your spine is meant to have curves when you look at it from the side and be straight up and down when you look at it from the front. The top two bones of your spine are protecting your brainstem. Your brainstem sends messages to your heart and lungs, your digestive system, and controls key hormones like serotonin. Anything that damages your spine or changes it from it's normal position will weaken your nervous system. The great news is that the position of your spine is measureable. If you have been in our office before, you know that we take over 40 measurements of your spine. We can see very clearly what areas of your spine are healthy and what areas are negatively impacting your health. With the introduction of technologies like smartphones, laptops, and tablets, changes to the spine have become more prevalent than ever before. Especially to your spinal curves. 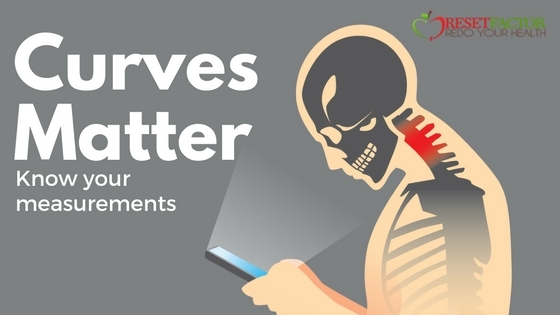 We are seeing an epidemic of people who have lost the curve in neck due the repetitive use of these technologies. Especially in children and teens who are growing up on smartphones and pokemon go. What symptoms can appear when your spinal curves straighten out? If you or your family have not had your spine measured, now is the time. We are having a Back To School Family Day on Saturday August 20th. All spinal and nutritional evaluations that day will be discounted. Appointment times are limited. Call my team for more information 408-298-8092 or to reserve your spot. We are committed to your long term health. We don't guess on anybody's health, we measure as many pieces of your health as we know to be helpful. When you know where your health imbalances lie, it becomes really easy to create a plan to fix them. Reach out if you need any help. We are here for you!